How many times have you got filled with excitement writting a list of all your dreams and wishes with the hope of making some of them come true? 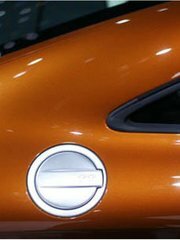 The metallic brown color used by Audi, Porsche and Volkswagen since 2010 in their whole model range. 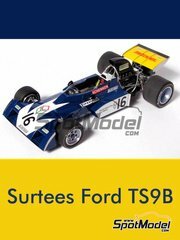 With Tamiya Lotus 99T as a base (ref. 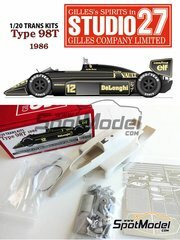 TAM20057), you can build the Lotus 98T using this transkit. 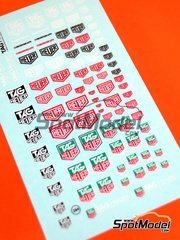 Set of logos of the world known watch manufacturer Tag Heuer, featuring different designs in asorted sizes. 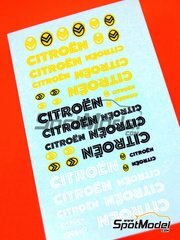 Set of assorted Citroën logos in black, white and yellow. Finally!!! 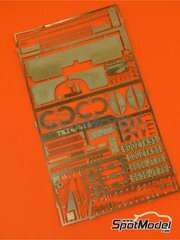 Here are the Renaissance photoetched parts we've been waiting for sooo long. 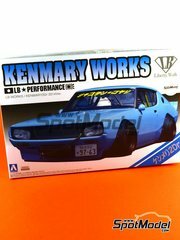 NOW you can build Hasegawa kit properly. 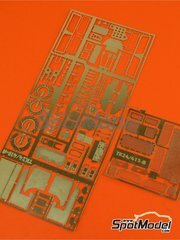 Set of photoetched parts for both the seasoned Esci kit and the newer Italeri scale model. 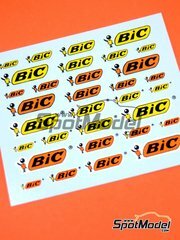 Different sized and colored BIC logos, the famous ball pen and razor manufacturer. 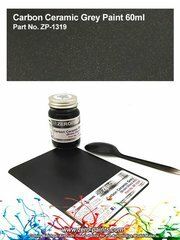 An superb new color formulation by Zero Paints: the carbon fiber grey. 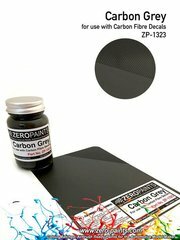 This is the perfect color to apply under carbon fiber decals, specially under those with transparent background. 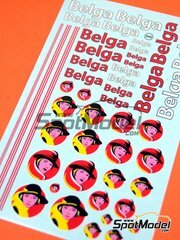 Decals set featuring the modern Belga logo. Modern Citroën logos, both with red and transparent background. 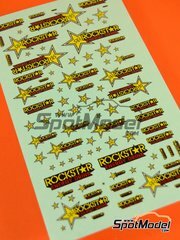 Asorted Rockstar energy drink logos decals for decorating your modern race and street cars. 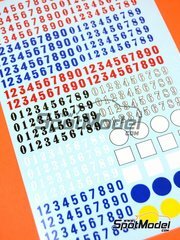 Set of assorted numbers in black, red, blue and white and in different typographies, for building your own number pads. 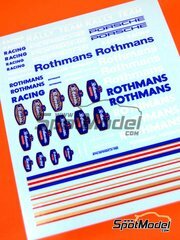 Rothmans Racing and Porsche logos in white and blue, in addition to the hairlines used in the brand cars. 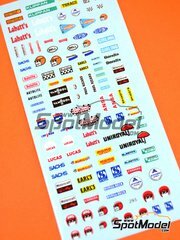 Set of assorted sponsor logos used in competition from 1960's to 1980's, such as Labatt's, Sachs, Bell, Autolite, Cheron, Lucas, Sachs, Gorg&Beck, Uniroyal, Ansa Vanhool, Firestone, Du Pont, Klippan, Bendix or Momo. 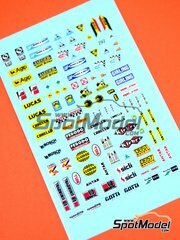 Set of assorted sponsor logos used in competition from 1960's to 1980's, such as Agip, Ferodo, Gotti, Carello, Kleber, Girling, Bosch, Jaeger, Sicli, Antar, Britax, Antar, Bell, Lucas, AP, Valvoline or OMP. Search no more: this is the exact color to give the perfect finish to the ceramic carbon brake disks used in Formula 1 cars, bikes and modern GTs. Absolutely essential for your workbench!! 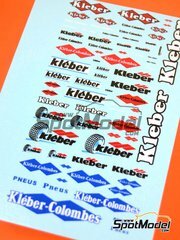 Modern and classic Klever logos, world known manufacturer of rain tyres. Exclusive kit in white metal by the renowned This Way Up brand. 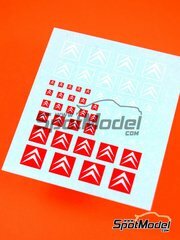 In addition to the included decal sheet, it also Includes a spare sheet in case you have any troubles during assembly. You will be amazed since you first see just the box: it is humongous and filled up with parts. Wonderful!! 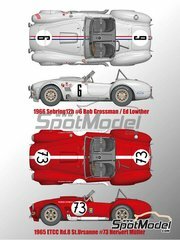 A trully appealing scale model. 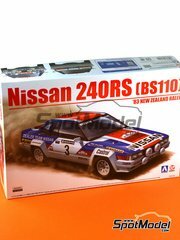 Finally available the long awaited kit of the Nissan 240RS. Do you dare? 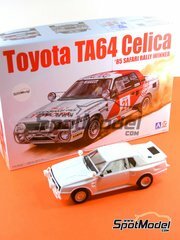 The 1985 Safari Rally winner... finally in a scale model kit!!!. The lads at Aoshima have done a great design job and the kit has an excellent part break up, magnificent detailing, and a really good building experience. The whole package!! The Liberty Walk tuned version of the Nissan Skyline, a true icon in Japan, now at the reach of your mouse thanks to Aoshima. 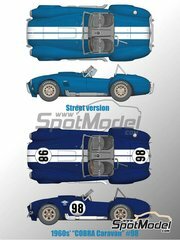 The kit includes fenders and all other complements injected in independent sprues. 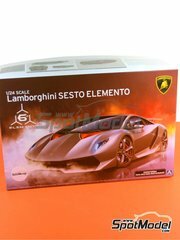 "Limited overseas edition" of the Lamborghini Sesto Elemento scale model kit, this one featuring a second bodywork in transparent plastic so you can see the most intimate parts of this beauty. 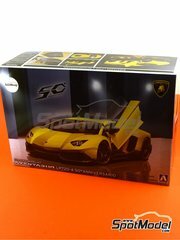 The kit includes a detailed engine, as well as an splendid parts break up. 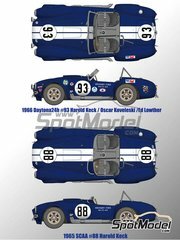 A really interesting kit.